« MtG: Powernauts GrowGrowGrow – Uninentionally Creating a Kickass Common Deck + Bonus Deck! 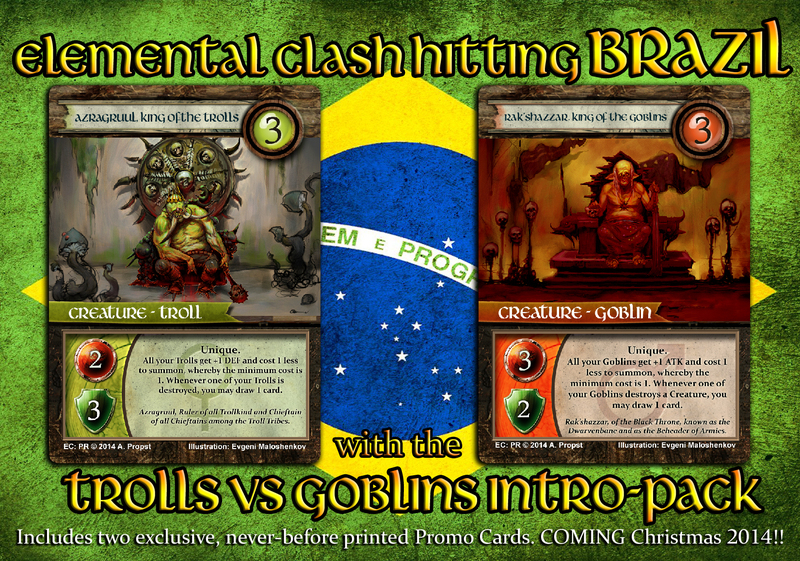 EC: Announcing the Trolls vs Goblins Duel Pack & EC going BRAZIL!! Dear friends and fans of the more or less obscure Elemental Clash Customizable Card Game!! It has been quite some time since I last posted about the game, but I have two amazing annoucnemnts in store for you this time around! Elemental Clash is soon to hit BRAZIL! on http://www.thegamecrafter.com, which will be an intro-type pack containing two ready-to-play 40 cards Theme Decks (The Troll and the Goblin Deck) and should be the perfect entry point for those who have been curious about Elemental Clash for a while but did not want to make the investment of purchasing the full Master Set. So I have been bravely soldiering on with my “firstborn” when it comes to games, that is of course nothing else than Elemental Clash, for years, tried numerous crowdfunders – without any success – and managed to release the approx. 300 cards Master Set as well as an equally voluminous expansion set (Legendary Legacy) all on my own, all funded out of my own pocket. Helio proposed to me to release the Elemental Clash Master Set in Brazil and to do whatever was in his powers to make the game a success over there! So we will be releasing the Brazilian version of this first of hopefully many Elemental Clash Duel Packs in Brazil in Portuguese language hopefully just in time for Christmas sales. The same will be done with the English version of the Pack, which will be available in about a week from now on http://www.thegamcrafter.com, exclusively. I will announce the actual release date on this here blog as soon as I know the definite date for the release! The Duel Pack Trolls vs Goblins will contain two readily-assembled and playable straight out of the box theme decks of 40 cards each – the Troll Deck (which will be of the Earth Element) and the Goblin Deck (of the Fire Element) and is hence intended to be an intro-type product and can be considered as the ideal entry point for those who are new to Elemental Clash and/or have been curious to try the game for a while already, yet weren’t willing to commit to purchasing a full Master Set. 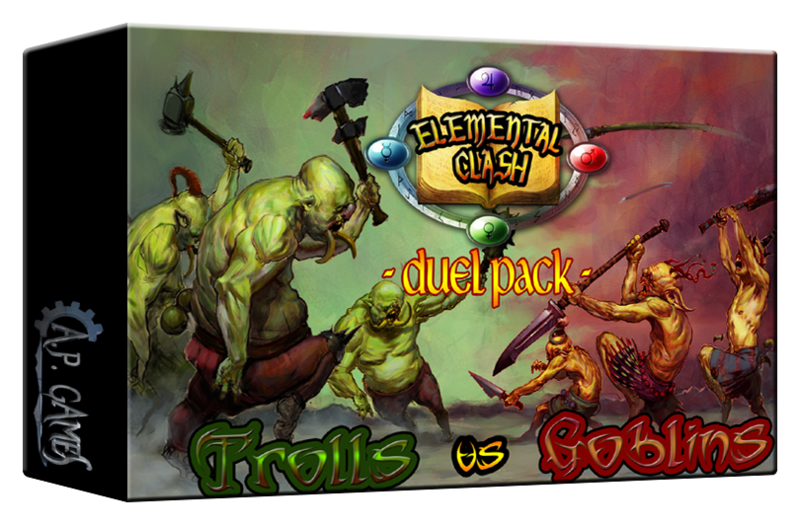 So if you are new to Elemental Clash and curious about the game, the Duel Pack: Trolls vs Goblins is your chance to take a dive into the fantastic world of the Elemental Clash Customizable Card Game! The Troll King and Goblin King promotional card artworks as well as the awesome cover art seen on the box shot preview above have been made by incredibly talented artist and illustrator Evgeni Maloshenkov, from the Ukraine, who defined the style, look and feel of both the Trolls and Goblins races or “Tribes” through his many fantastic artistic contributions to the Elemental Clash: Legendary Legacy Expansion Set. 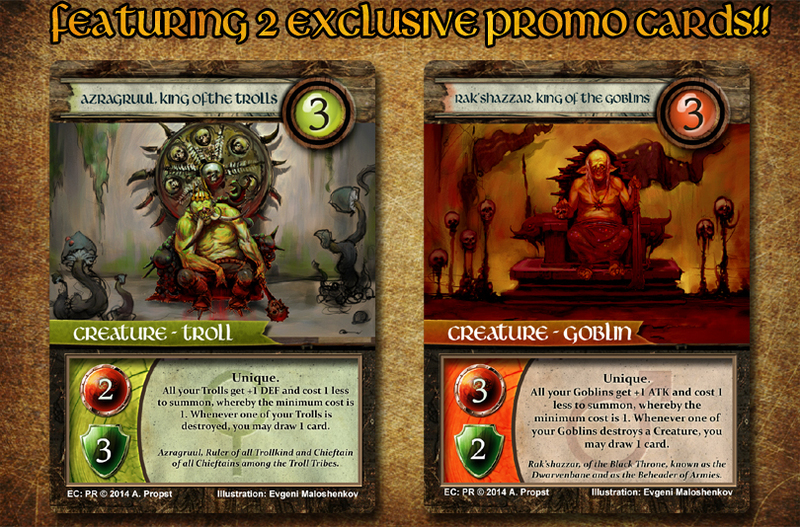 …and here some card previews straight out of the Goblins Deck, also done by the same, hightly gifted illustrator. 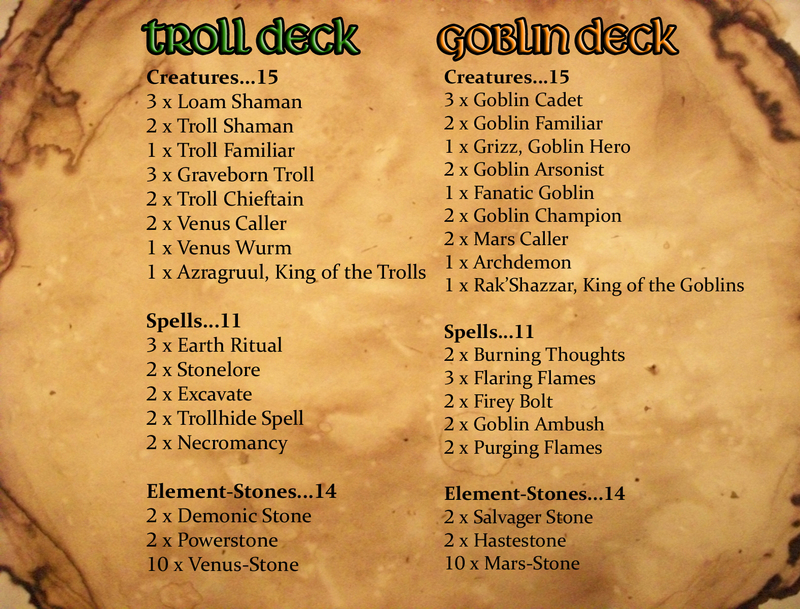 Lastly, to close this article of amazing announcements, I will provide you with the full card list for the Trolls and Goblins Decks, just in case you want to know in detail what cards will be found in each deck. You will find all the cards in the following list at http://www.elementalclash.com under the “Cards” section, as all are either from the Master Set or the Legendary Legacy Expansion, with the exception of the promotional, exclusive Troll Kind and Goblin King cards shown above! I will publish the Duel Pack to the TGC Shop officially within about one week’s time from now and will keep you all updated on this, as well as on the exciting developments over in Brazil! !